SUMMARY: This clinical report describes the enhancement characteristics of hypersecreting parathyroid lesions on dual-phase neck CT. We retrospectively analyzed the enhancement characteristics of 5 pathologically confirmed PTH-secreting lesions on dual-phase CT examinations. Attenuation values were measured for PTH-secreting lesions, vascular structures (CCA and IJV), and soft tissue structures (thyroid gland, jugulodigastric lymph node, and submandibular gland). From the attenuation values, “relative enhancement washout percentage” and “tissue-vascular ratio” were calculated and compared. All lesions decreased in attenuation from arterial to venous phase, while the mean attenuation values of other soft tissue structures increased. A high relative enhancement washout percentage was correlated with parathyroid lesions (P < .006). The tissue-CCA ratio and tissue-IJV ratio for PTH-secreting lesions in the arterial phase were statistically significantly higher compared with soft tissue structures (P < .05). If these results are validated in future larger studies, noncontrast and delayed venous phases of 4D-CT could be eliminated to markedly reduce radiation exposure. Most cases of primary hyperparathyroidism are due to benign parathyroid adenomas and parathyroid hyperplasia. These lesions are sometimes difficult to identify at surgery and on imaging due to variations in number and location of abnormal parathyroid glands, with multiglandular hyperplasia and multiglandular adenomas occurring in up to 14% of cases.1,2 Ectopic parathyroid adenomas and ectopic parathyroid hyperplasia account for 20–25% of cases.3,4 Initial work-up in a patient with primary hyperparathyroidism usually consists of sonography or technetium (Tc)99m sestamibi scintigraphy with or without SPECT imaging. When these tests are negative, second-tier imaging investigations, such as 4D-CT and MR imaging of the neck, can be helpful in preoperative planning. The original description of 4D-CT includes image sets in 3 planes (axial, coronal, and sagittal).5 The “fourth” dimension of 4D-CT is the perfusion information derived from noncontrast, arterial, and venous phase imaging. Since this paper was published, different institutions have produced modified protocols. Some have interpreted “4D” as a 4-phase neck CT with precontrast and 3 postcontrast phases of neck imaging.6⇓⇓–9 Others image with precontrast and single postcontrast neck phases,10 or postcontrast arterial and venous phases only.11 Because of these multiple phases of imaging, 4D-CT has been criticized for its high radiation dose. To reduce radiation dose, but still obtain perfusion information that might allow detection of parathyroid lesions, we have modified the protocol at our institution to dual-phase scanning with only arterial and venous phase imaging. The aim of this clinical report is to describe the enhancement characteristics of hypersecreting parathyroid lesions on dual-phase neck CT. Our hypothesis is that PTH-secreting lesions have unique enhancement characteristics, allowing their differentiation from other soft tissue structures of the neck on dual-phase CT.
Two neuroradiologists retrospectively reviewed 6 patients with primary hyperparathyroidism who underwent dual-phase neck CT examinations between July 2009 and June 2010. The size and location of suspected parathyroid lesions were compared with the operative reports, pathologic analysis of the surgically removed lesions, and patient PTH levels. One patient was excluded from our study because the lesion suspected on CT (a very small intrathyroid lesion that subjectively appeared hyperenhancing in the arterial phase with early washout in the venous phase) was not confirmed pathologically to represent a parathyroid lesion (but rather a thyroid nodule). Two other patients were excluded because no lesions were detected on CT or at surgery. The remaining 3 patients (all females, mean age 46 years) had a total of 5 pathologically confirmed PTH-secreting lesions (Table 1). These 5 lesions were evaluated for imaging and enhancement characteristics. The study was approved by our institutional review board and was compliant with the Health Insurance Portability and Accountability Act. A neuroradiologist measured the HU attenuation values on the arterial and venous phase axial CT images for 1) PTH-secreting lesions; 2) vascular structures—CCA and IJV; and 3) soft tissue structures—thyroid gland, jugulodigastric lymph node, and submandibular gland. The attenuation values of the normal soft tissue structures and the CCA were measured on the ipsilateral side of the PTH-secreting lesion. The IJV enhancement was measured on the contralateral side of injection to avoid artifact from the refluxed high-attenuation contrast. Two predictive indices were calculated. First, relative enhancement washout percentage was calculated with the following equation:([HU tissuearterial phase − HU tissuevenous phase]/HU tissuearterial phase)× 100. A washout percentage with a positive value indicated true washout of contrast from the structure, while a negative washout percentage value reflected increasing enhancement (wash-in) in that structure. Second, “tissue-vascular ratio” was determined for the PTH-secreting lesions and other soft tissue structures with the following equations: HU tissue/HU CCA and HU tissue/HU IJV. Tissue-CCA and tissue-IJV ratios were calculated in both the arterial and venous phases, giving 4 tissue-vascular enhancement ratios for each structure. Data were entered in an Excel spreadsheet (Microsoft, Redmond, Washington). Statistical analysis was performed using JMP version 9 (SAS Institute, Cary, North Carolina). Predictive indices for the PTH-secreting lesions were compared with those of other soft tissue structures with the unpaired t test. A ROC was constructed to determine a diagnostic cutoff value for the PTH-secreting lesions. Table 2 shows the mean attenuation values of the PTH-secreting lesions and other soft tissue structures in the arterial and venous phases of imaging. In the arterial phase, the mean attenuation of the thyroid overlapped with hyperenhancing PTH-secreting lesions (P = .27), while in the venous phase, the mean attenuations of lymph nodes and salivary glandular tissue (submandibular gland) were not significantly different from that of PTH-secreting lesions (P > .21). All parathyroid lesions in our study decreased in attenuation from arterial phase to venous phase. The mean attenuation values for other soft tissue structures increased (Table 2, Figs 1 and 2). Mean enhancement of PTH-secreting lesions compared with other neck soft tissue structures. 76-year-old woman with left juxta-thyroid parathyroid hyperplasia. A, Arterial phase image shows the hyperenhancing parathyroid lesion (arrow), which has higher attenuation than the adjacent thyroid gland (arrowhead). B, Venous phase image shows decreased attenuation of the parathyroid lesion (arrow), representing rapid washout of contrast. The adjacent thyroid gland (arrowhead) has higher attenuation than during the arterial phase. PTH-secreting lesions had a mean relative enhancement washout percentage of 30.5% (Table 2). Other tissues had mean washout percentages with negative values, indicating increasing tissue enhancement (wash-in). ROC analysis found that a cutoff washout percentage of >11.3% was 100% sensitive and 90% specific for PTH-secreting lesions (a ROC of 0.94). The tissue-CCA ratio and tissue-IJV ratio for PTH-secreting lesions in the arterial phase were significantly higher compared with other soft tissue structures (P < .05) (Table 3). ROC analysis found that an arterial phase tissue-CCA ratio >0.47 or tissue-IJV ratio >0.92 were 100% sensitive and 90% specific for PTH-secreting lesions (a ROC of 0.93). 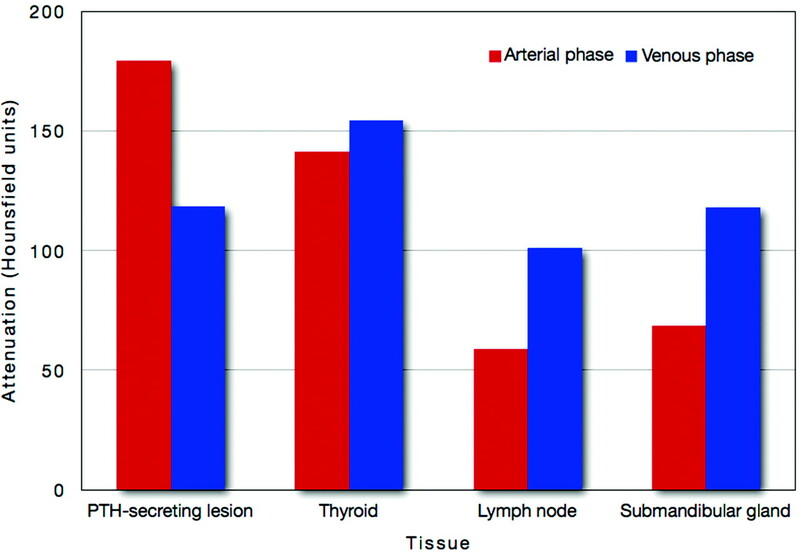 In the venous phase, tissue-vascular ratios were not significantly different between PTH-secreting lesions and normal soft tissue structures (Table 3). Although some studies showed 4D-CT to be more efficacious than sonography and sestamibi imaging in localizing and lateralizing hyperfunctioning parathyroid tissue, 4D-CT has not been widely adopted by radiologists.5,9,10 The high radiation dose delivered with multiphase imaging, equivalent to 3–4 neck CT scans, is of concern. There are also variations in the 4D-CT imaging protocols currently performed at different centers, with some institutions including precontrast and single postcontrast phases,10 other centers using postcontrast arterial and venous phases only,11 and others obtaining precontrast and 3 postcontrast phases of neck imaging.6⇓⇓–9 In this clinical report, we describe the enhancement characteristics of PTH-secreting lesions on dual-phase arterial and venous imaging, which would differentiate them from other soft tissue structures in the neck. The rationale behind multiphase imaging is that parathyroid lesions have enhancement characteristics of “rapid uptake and washout.”7,9,12 Beland et al7 were the first to quantify the enhancement by measuring the attenuation values of adenomas. They reported higher mean densities of parathyroid adenomas at 30 and 60 seconds after contrast injection in comparison with cervical lymph nodes. In their study, which used 4 phases of scanning, the noncontrast and delayed phase scans did not discriminate adenomas from normal tissue. Our results show that on dual-phase imaging, there are characteristic enhancement features of parathyroid lesions distinct from other soft tissue structures. All PTH-secreting lesions in our study had early arterial enhancement and rapid venous phase washout of contrast, resulting in a significantly higher relative enhancement washout percentage and higher arterial phase tissue-vascular ratio compared with lymph nodes, thyroid glands, and submandibular glands. The clinical significance of these findings is that the 4D-CT protocol could potentially be reduced to 2 phases, eliminating the noncontrast and delayed postcontrast venous phases of imaging. Single-phase CT imaging has been performed for parathyroid lesions in the venous phase with a reported sensitivity of 70%.3 Our study shows that using the venous phase alone is the least helpful, because the enhancement characteristics of PTH-secreting lesions overlap with thyroid or submandibular glandular tissue and lymph nodes. Single-phase arterial imaging has been advocated in 1 study as an adjunctive test to sonography.1 We found that imaging in the arterial phase alone could be helpful, based on the tissue-vascular ratios, but there would be foreseeable circumstances in which high-attenuation thyroid nodules may be difficult to differentiate from PTH-secreting lesions. Kutler et al10 address this potential pitfall by combining an early postcontrast phase (50 seconds delay) with a noncontrast phase CT. We did not study the role of the noncontrast phase and compare it with our protocol, but an advantage of our protocol, with 2 contrasted phases, is that it provides contrast washout information, which allows potential lesions to be assessed visually or quantitatively in the form of calculated relative enhancement washout percentages. In addition, the change in enhancement on the 2 contrast phases would indicate a hyperenhancing lesion was not a high-attenuation thyroid nodule. We recognize that our method of relying on attenuation values alone could give rise to false-negative and false-positive results. False-negative results may be seen in parathyroid lesions that do not avidly enhance, such as cystic or fat-containing adenomas. Fortunately, in the literature, these atypical adenomas are generally larger lesions.13 False-positive results may arise from pathologic hypervascular lymph nodes or thyroid nodules that may mimic hyperenhancing parathyroid tissue. There are several limitations to our study. First, this was retrospective with a small study population. The small number of patients in our study underscores the intended use of 4D-CT as a second-line imaging for preoperative localization of PTH secreting-lesions in patients with primary hyperparathyroidism. At our institution, this study is only performed if the sonography and sestamibi scan failed to localize the parathyroid pathology or if the patient has a history of unsuccessful surgical neck exploration. Future validation of this method will require study of more patients. Second, our 5 parathyroid lesions had heterogeneous pathology, including a rare case of PTH-secreting paraganglial hyperplasia. None of the cases were typical parathyroid adenomas on pathology. On dual-phase CT, PTH-secreting lesions have early arterial enhancement and rapid venous phase washout compared with other soft tissue structures, resulting in a significantly higher “relative enhancement washout percentage” and higher arterial phase “tissue-vascular ratio.” If these results are validated in future larger studies, the implication is that noncontrast and delayed venous phases of 4D-CT could be eliminated to reduce the total radiation exposure to the patient. Paper previously presented at: Annual Meeting of the American Society of Head and Neck Radiology, October 2010; Houston, Texas. Disclosures: Christine Glastonbury—UNRELATED: Consultancy: Amirsys, Comments: StatDX author, book author; Royalties: Amirsys, Comments: Book sales; Stock/Stock Options: Amirsys. Accepted after revision August 23, 2011.